11:1 And it came to pass, when Yeshua (ישוע) had made an end of commanding His Shneym Asar (Twelve) talmidim, he departed thence to teach and to proclaim in their cities. 11:3 and said to Him, "Are You the Coming One, or do we look for another?" the poor have the goodnews proclaimed to them. 11:6 And happy is [he], whosoever shall not be offended in Me. (Yeshayahu 61:1). 11:7 And as they departed, Yeshua (ישוע) began to say to the multitudes concerning Yochanan, What went you out into the midbar to see? A reed shaken with the wind? 11:8 But what went you out for to see? A man clothed in soft raiment? Hinnei, they that wear soft [clothing] are in kings' houses. 11:9 But what went you out for to see? A Navi? yea, I say to you, and more than a Navi. 11:10 For this is [he], of whom it is written, Hinnei, I send my Malak before your face, which *shall prepare your way before thee. 11:12 And from the days of Yochanan the Immerser until now the Malkut HaShamayim suffereth violence, and the violent take it by force. 11:13 For all the Neviim and the Torah prophesied with regards to Yochanan. 11:14 And if you will receive [it], this is EliYahu, which was for to comes. 11:15 He that has ears to hear, let him hear. 11:17 And saying, We have piped to you, and you have not danced; we have mourned to you, and you have not lamented. 11:19 BEN ADAM came eating and drinking, and they say, Hinnei a man gluttonous, and a winebibber, a friend of tax collectors and sinners. But wisdom is justified of her children. 11:20 Then he began to denounce the cities where most of his mighty works had been done, because they did not repent. 11:21 Woe to you, Korazin! (כּוֹרָזִִים) Woe to you, Beit Tzada (house of fish)! For if the mighty works, which were done in you, had been done in Tzor and Tzidon, they would have repented long ago in sackcloth and ashes. 11:23 And you, K'far-Nachum , which art exalted to Shamayim, shalt be brought down to hell: for if the mighty works, which have been done in thee, had been done in Sedom, it would have remained until this day. 11:24 But I say to you, That it shall be more tolerable for the eretz Sedom in Yom Hadin, than for thee. 11:25 At that time Yeshua (ישוע) answered and said, I thank you, O AVI, Adonay Shamayim and eretz, because you have hid these things from the wise and prudent, and hast revealed them to babes. 11:26 Even so, AVI: for so it seemed tov in your sight. 11:27 All things are delivered to me of My AVI: and no man knows the Son, but the AVI; neither knows any man the AVI, save the SON, and he to whomsoever the SON will reveal him. 11:28 Come to Me, all you that labour and are heavy laden, and I will give you rest. 11:29 Take My ol (yoke; על) upon you, and learn of me; for I am meek and lowly in heart: and you shall find rest to your nefashot. 11:30 For My ol (yoke; על) [is] easy, and My burden is light. Yoke (1) The usual word is עול, ‛o l (Gen 27:40, etc. ), less commonly the (apparently later) form מוטה, mo ṭa h (Isa 58:6, etc. ; in Nab Yeshayahu 1:13 מוט, mo ṭ), which the Revised Version (British and American) in Yirmeyahu 27; 28 translates “bar” (a most needless and obscuring change). The Greek in Apocrypha (Sirach 28:19, etc.) and in the New Covenant (MattitYahu 11:29 f, etc.) is invariably ζυγός, zugós. Mitries monuments show a yoke that consisted of a straight bar fastened to the foreheads of the cattle at the root of the horns, and such yokes were no doubt used in Palestine also; but the more usual form was one that rested on the neck (Gen 27:40, etc.). It was provided with straight “bars” (mo ṭo th in Lev 26:13; Eze 34:27) projecting downward, against which the shoulders of the oxen pressed, and it was held in position by thongs or “bonds” (mo ṣe ro th in Yirmeyahu 2:20; Yirmeyahu 5:5; Yirmeyahu 27:2; Yirmeyahu 30:8; 'ăghuddo th in Yeshayahu 58:6, “bands”), fastened under the animals' throats. Such yokes could of course be of any weight (1Ki 12:4 ff), depending on the nature of the work to be done, but the use of “iron yokes” (Deu 28:48; Yirmeyahu 28:13 f) must have been very rare, if, indeed, the phrase is anything more than a figure of speech. What is meant by “the yoke on their jaws” in Hos 11:4 is quite obscure. Possibly a horse's bit is meant; possibly the phrase is a condensed form for “the yoke that prevents their feeding”; possibly the text is corrupt. See JAW. The figurative use of “yoke” in the sense of “servitude” is intensely obvious (compare especially Yirmeyahu 27, 28). Attention needs to be called only to Lam 3:27, where “disciplining sorrow” is meant, and to Yirmeyahu 5:5, where the phrase is a figure for “the Torah of Elohim.” This last use became popular with the Jews at a later period and it is found, e.g. in Apocrypha Baruch 41:3; Psalter of Solomon 7:9; 17:32; Ab. iii. 7,. and in this sense the phrase is employed. 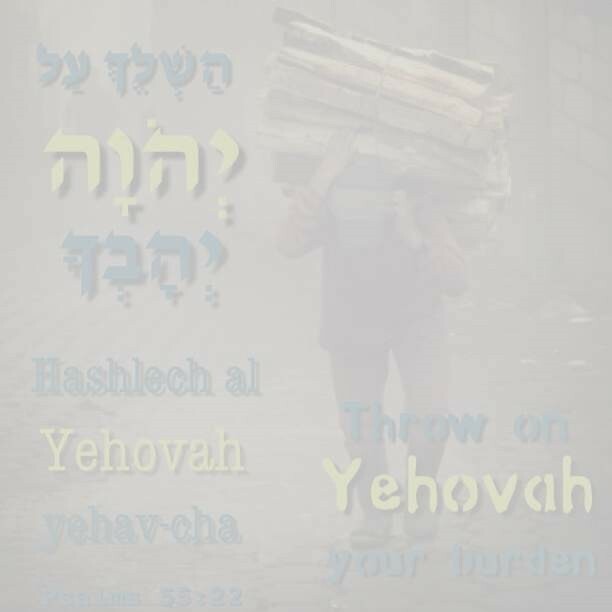 by Mashiach in MattitYahu 11:29 f. “My yoke” here means “the service of Elohim as I teach it” (the common interpretation, “the sorrows that I bear,” is utterly irrelevant) and the emphasis is on “my.” The contrast is not between “yoke” and “no yoke,” but between “my teaching” (light yoke) and “the current scribal teaching'; (heavy yoke). (2) “Yoke” in the sense of “a pair of oxen” is צמד, cemedh (1Sa 11:7, etc. ), or ζεῦγος, zeúgos (Luk 14:19). Kefa Alef 5:7 Casting all your care upon him; for He cares for you. The word "YEHAV" in this verse is a rare word that only appears here in the scripture. One day a rabbi was traveling with a caravan of nomads lugging a heavy load on his back when one of the camel drivers said to him: "Lift up your yehav and throw it on one of the camels." 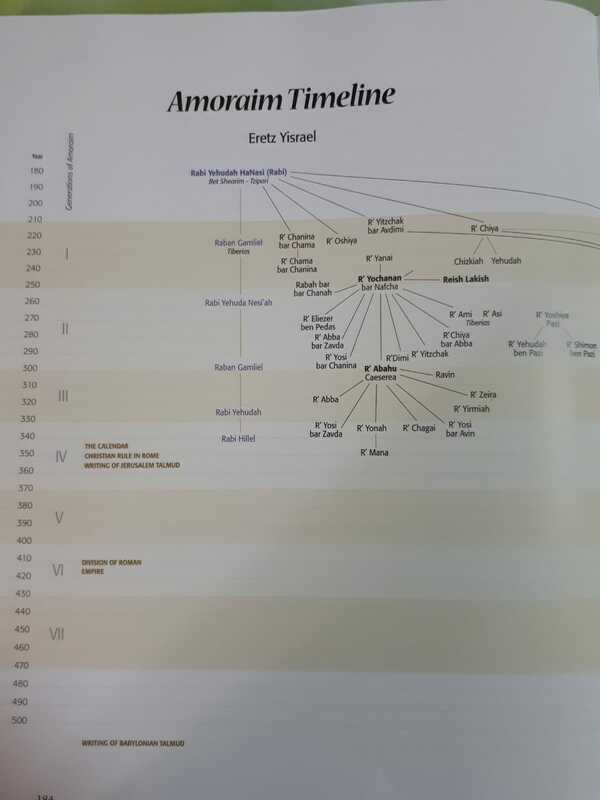 The Yishmaelites were descendants of Avraham and spoke a language related to Hebrew. 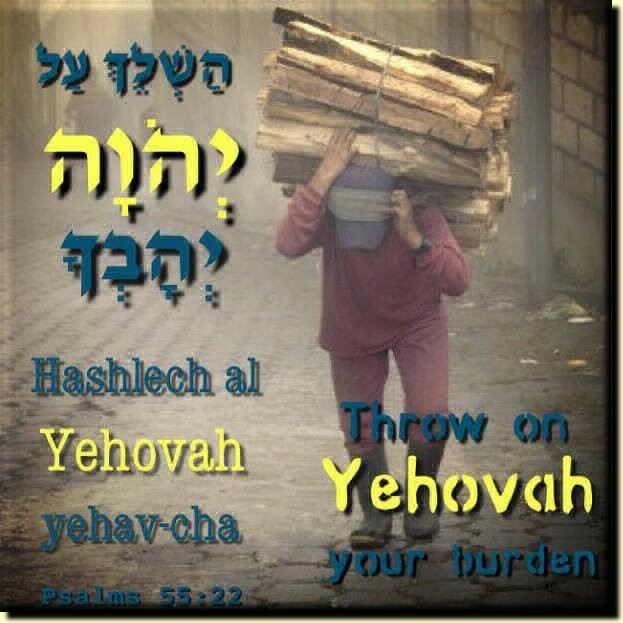 The rabbi immediately recognized that the word yehav means a heavy burden. The verse is telling us to trust in Elohim by turning our worries over to Him. Chorazin (Hebrew: כורזים‎, Korazim; also Karraza, Kh. Karazeh, Chorizim, Kerazeh, Korazin ) meaning a furnacle of smoke - secrets, mystery. It was an ancient village in northern Galil, two and a half miles from K'far-Nachum on a hill above the northern shore of Yam Galil.The Babylonian Talmud (Menahot, 85a) mentions that Chorazin was a town known for its grain. Chorazin Geographic nature was a steep sun-exposed hillside, with its dark coloration tends to warm up in the springtime, much earlier than surrounding areas. Today this natural process is known as insoltation. The city prospered in the 2nd century a.d. when the region expanded with refugees from the Bar Kochba Rebellion. Khirbet Karâzeh (2031.2575), ca. 3 km. (2 mi.) NW of Capernaum, was first identified as Chorazin in the middle of the 19th century. 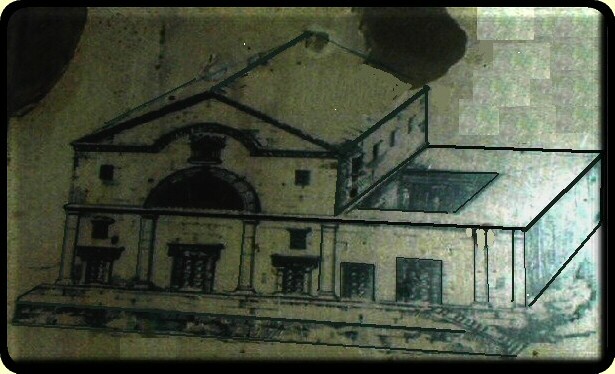 The Israel Department of Antiquities and Museums conducted excavations there in 1962-65 and restoration work in 1982-86. 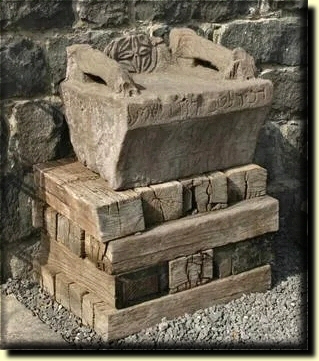 In 1926, archaeologists discovered the "Seat of Moshe," carved from a basalt block. According to the New Testament, this is where the reader of the Torah sat (Matthew 23:1-3). Yeshua reason that His people did not accept His teachings display of their utterly unbelief in the face of His mighty works and refuse to repent, return, make teshuvah, even though the people had witnessed His Miracles (Matthew 11:20-24). Our Coach drive pass the Lake Huleh, the tour guide told us that this lake has already transformed into agriculture farmland, they have successfully remove the salt content from the lake.